After this year’s seemingly never ending winter, it’s a joy to see the arrival of spring and the arrival of fresh vegetables like asparagus, baby artichokes, and new beets. Early fruits include rhubarb and strawberries, and I can’t wait to start to use them in my meals. One of the first things I made was this sweet, creamy strawberry-coconut panna cotta. The strawberries are served up in two ways–sliced and sweetened as a topping, and cooked into the ruby-red gelatin. I showcased it’s pretty layers by serving it in wine glasses. This dessert gets it’s coconut flavor thru coconut milk, and the recipe calls for both regular coconut milk and light coconut milk. If you prefer to use all light coconut milk you certainly can, but it’s amazing how much flavor and creamy consistency you get from mixing in a little full-fat coconut milk. I already had some cream of coconut open in my refrigerator, so I used that, and thinned it with skim milk. This allowed me to keep the fat content low, but still get the coconut flavor. The cream of coconut is sweet, so I used only 1 Tablespoon of sugar in the panna cotta. ** If using cream of coconut, make a 50-50 mixture of cream of coconut and fat-free milk for a total of 3/4 cup of liquid. 1. To make the strawberry gelatin: Sprinkle 1 teaspoon gelatin over 1 tablespoon water in a small bowl. Combine the strawberries, the sugar and lemon juice in a small saucepan; let stand for 5 minutes. Mash mixture with a fork or a potato masher. Place pan over medium-high heat. Bring to a simmer; cook 2 minutes or until sugar dissolves. Add the water; return to a simmer. Remove from the heat. Add gelatin mixture, stirring until gelatin dissolves. Strain mixture through a fine sieve into a measuring cup, pressing on solids to extract as much liquid as possible. Discard solids. Divide strawberry mixture evenly among 4 wineglasses. Chill 1 hour or until set. 2. To make the panna cotta: Sprinkle 3/4 tsp. gelatin over the 1 tbsp. water in a small bowl. Combine coconut milks, sugar, and 1 tsp. lemon juice in a saucepan; bring to a simmer. Remove from heat. Add gelatin mixture, stirring until gelatin dissolves. Cool to room temperature. Carefully pour one-fourth of this mixture on top of each strawberry gelatin. Chill 1 hour or until set. 3. To prepare strawberries: Combine remaining ingredients in a bowl; toss gently. Let stand 5 minutes. Divide strawberry mixture evenly among the glasses. With a new toy to play with (my popsicle mold), I’ve been dreaming up all kinds of flavors and while most of them have been pretty good, this one, I think, is outstanding. Pureed mango and coconut milk with a little shredded coconut thrown in just to really taste the flavor. I can’t even begin to tell you how delicious they are. Sweet pureed mango and silky, smooth coconut are a match made for each other. Sort of like a Piña Colada. Want to know what else is great about them? They are only 68 calories each. Whoo-Hoo! 1. Puree mango in the blender with 1/4 cup of the coconut milk beverage and sugar and blend until smooth. Pour out into a small bowl and set aside. 2. In the blender container, combine the remaining coconut milk beverage, canned coconut milk, honey, shredded coconut and coconut flavoring, if using. Blend briefly to thoroughly mix and chop the coconut. 3. Pour, or spoon, about 2 Tablespoons of mango puree into each popsicle mold then pour in coconut milk mixture, until all the molds are filled. Cover the molds, insert sticks, and place the molds in the freezer and freeze until solid, about 5 to 6 hours. Fill the molds, cover, insert sticks, then freeze. A non-dairy ice cream that is rich and creamy. I scream, you scream, we all scream for ice cream, but not everyone can eat the traditional dairy version of ice cream. Even though we love the full-fat dairy ice-creams, I have been experimenting with using other non-dairy ingredients to still get a creamy satisfying frozen dessert, with less fat and sugar. I had not been aware until recently how many products are available and how rich and satisfying a dessert can be when using them. This recipe today is for a wonderful chocolate hazelnut ice cream using coconut milk. It also includes cocoa powder and maple syrup as a sweetener. The hazelnut flavor can be intensified through the addition of about 1/4 cup Hazelnut liqueur, but that is optional. To make: Pour all the above ingredients, except the nuts and Hazelnut liqueur, into a blender container and process till smooth. Pour into a covered bowl and chill overnight. The next day, pour into the canister of an ice-cream maker and process as per directions. In the last couple of minutes add the nuts and the liqueur, if using. Alcohol products are added at the end of processing time so they do not interfere with the freezing process. Freeze in an ice-cream container until firm. I was excited to make this recipe to try out serving quinoa as a hot cereal. This highly nutritious grain has been gaining favor with us ever since I first prepared it and served it in place of rice. It’s toasty, nutty, flavor is very pleasant, to say nothing of its high protein content. So I was particularly anxious to see if we would like it for breakfast. I found it to be very enjoyable, but Mr. D. thought it was a little too sweet for him as a cereal. However, I think that children might like this very much, thinking that it resembles dessert. The recipe is very easy to make, and you can top it off with a mixture of seasonal fruits and coconut, or nuts. The recipe calls for using coconut milk, but I used almond milk instead. The recipe also suggests strawberries and bananas as the fruits, but you can see by my pictures that I used mango and blueberries along with toasted coconut. The cooked quinoa is slightly sweet, and creamy, so you can use a tart fruit as a flavor contrast. Like most whole grains it is quite filling, and we were satisfied with just this for breakfast, but if you need more, you may want to add an egg on the side. You will most likely be toasting the coconut, so remember to keep an eye on it as it is toasting, so that it doesn’t burn. coconut flakes, almond milk, mango and quinoa make up a nutritious breakfast. 2. Rinse quinoa well in a fine strainer or sieve. Place in a medium sauce pan. 3. Combine quinoa, coconut milk, water, brown sugar, and salt. Bring to a a boil. 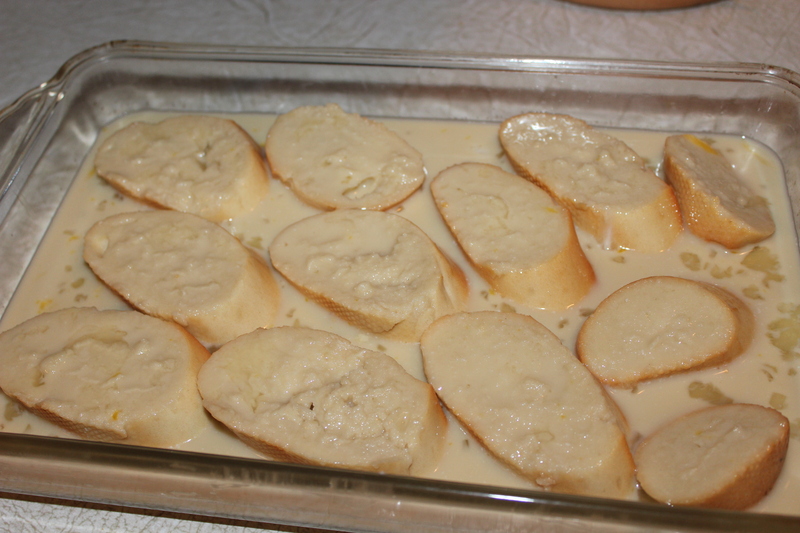 Reduce heat, and simmer 15 minutes or until liquid is absorbed stirring occasionally. Stir mixture constantly during the last 2 minutes of cooking. 4. While quinoa cooks, spread coconut in a single layer on a baking sheet. Bake at 400* for 5 minutes or until golden brown. Cool slightly. 5. Place about 1/2 cup quinoa in each bowl. 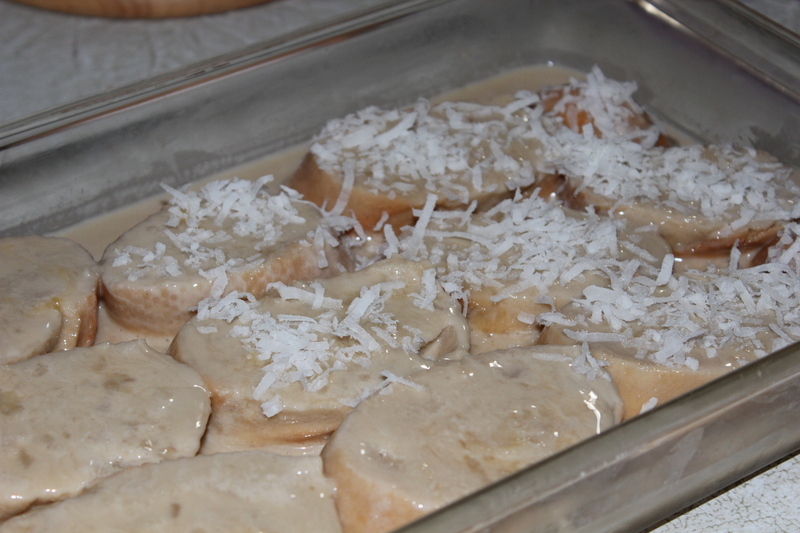 Top each serving with 1/2 the strawberries and 1/2 the bananas, and 1 Tablespoon toasted coconut. Serve warm. Weekday mornings are so rushed with getting ready for work, breakfast is usually something quick like a scone or granola bar with coffee. But on the weekend I like to make more complete breakfasts, to be enjoyed more leisurely. 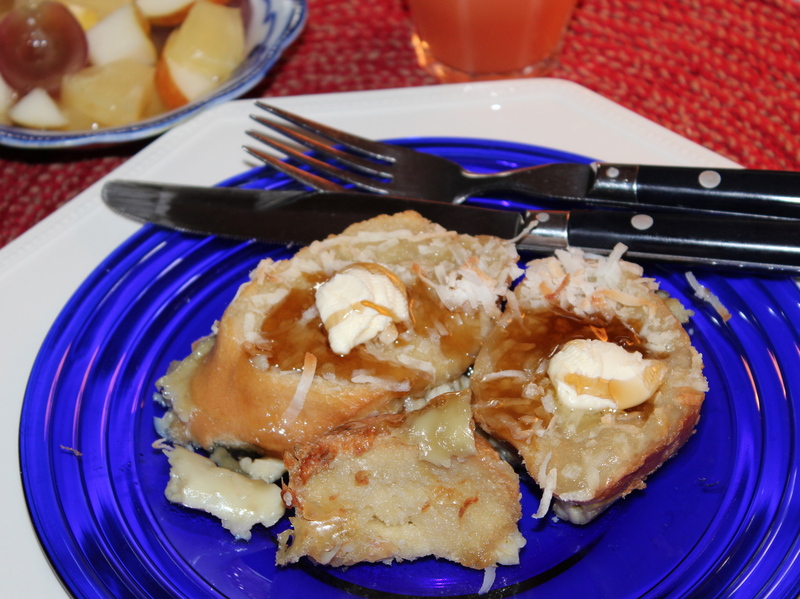 This weekend I made this recipe for a baked French Toast that was fantastic! The recipe was one that I had clipped out of a magazine some time ago and tucked into one of my (many) recipe books and forgot about. While I was looking for another recipe this one fell out onto my lap. When this kind of thing happens I take it as a sign that now is the right time to make it, and so I did. 1. Arrange the slices of bread in a single layer in a 13″ x 9″ bake pan, or 12″ x 8″ pan coated with cooking spray. 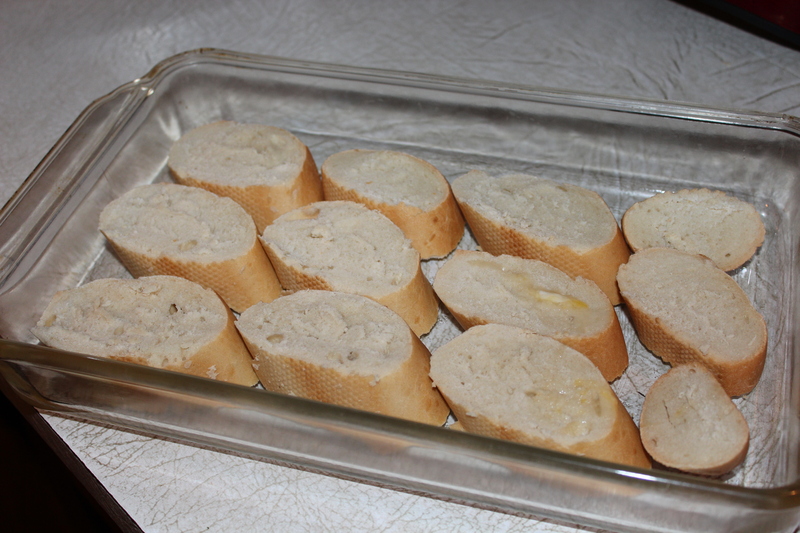 Arrange Bread slices in baking pan. 2. Combine the coconut milk, eggs or egg substitute, sugar and vanilla, stirring with a whisk, and pour evenly over the bread slices. 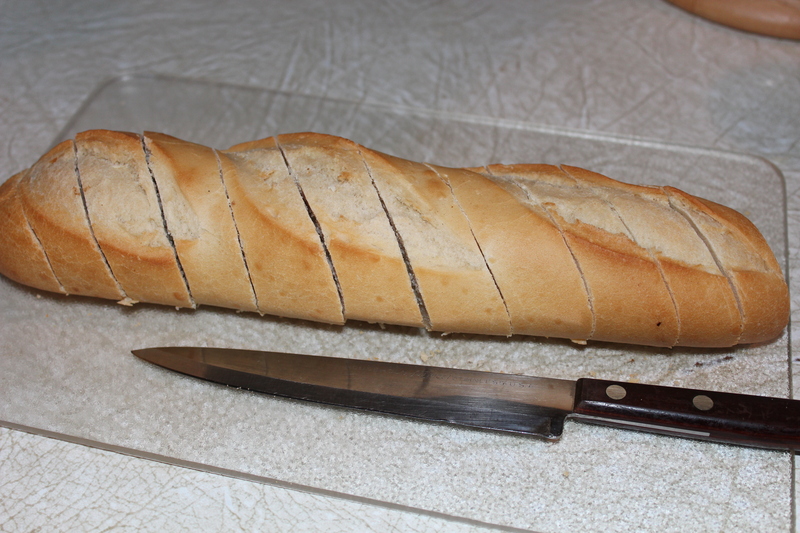 Turn the bread over to coat both sides. Cover with plastic wrap and refrigerate for 8 hours or overnight. 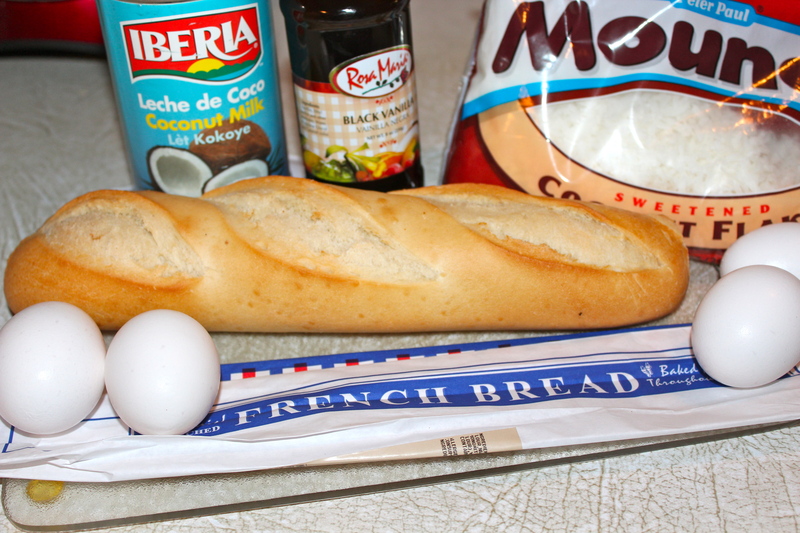 Pour egg and milk mixture over bread slices. 4. Remove bread from refrigerator, and uncover. Turn bread slices over, and sprinkle evenly with flaked coconut. Let it stand at room temperature 15 minutes. Bake, uncovered, at 350 for 30 minutes or until coconut is golden. Turn bread over and sprinkle with coconut before baking. 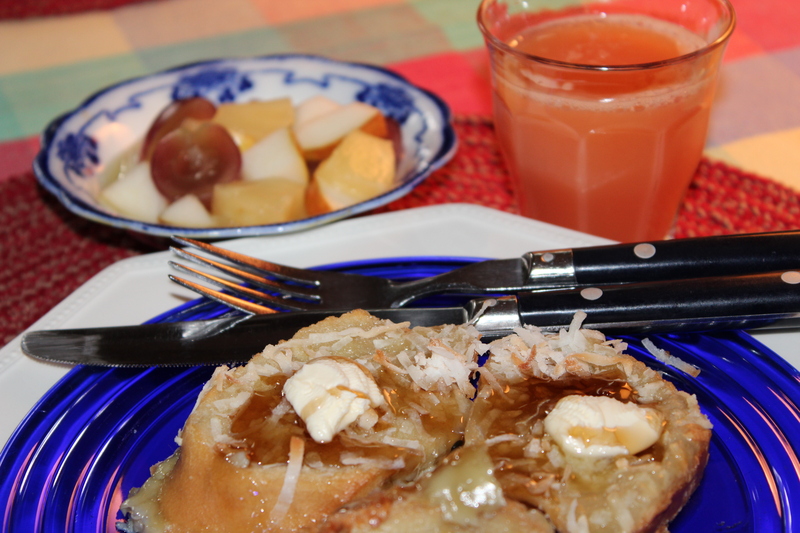 Serve warm with a fresh fruit compote to complete a very enjoyable breakfast or brunch. Serve with fresh fruit compote.